One small step for older people with frailty, one giant leap for frailty care? In what is thought to be a global first for frailty care, GP practices across England have been contractually required to undertake routine frailty identification and frailty care for patients who are 65 and over from 1 October 2017. By 31st March 2018, over 2.5 million people aged 65 and over living in England had received a frailty assessment, which has led to 950,000 confirmed diagnoses of either moderate or severe frailty. Around two-thirds of the 320,000 people diagnosed with severe frailty have also received one or more important intervention to help them reduce their risk of falls, side effects of medication, or poor co-ordination of care. Frailty is a recognised long-term condition which mainly affects older people. It is a condition in which people become less able to recover from difficulties they experience during everyday life. Their increased vulnerability means that even little upsets which may seem quite trivial to someone who does not have frailty, can have a more profound impact on those individuals living with the condition. These potential ‘stressor’ events are most often associated with physical health issues but can occur in any area of a person’s life, such as a bereavement or a spell of unusually hot or cold weather. Our analysis of the GP contract data published by NHS Digital on 17th May 2018 highlights the progress that has been made, but also the wide variation across GP practices. Prior to the requirements of the GP contract, most people have had their frailty identified late, usually in an Emergency Department, frequently having presented with an injury from a fall, immobility, a new onset of incontinence, or an infection which may have led to acute confusion or delirium. All of which may have been caused, or compounded, by the side-effects of medication. These frailty syndromes are increasingly recognised in hospitals and can lead to patients receiving the gold standard comprehensive geriatric assessment(CGA). But, too often, these individuals endure extended stays in hospital that worsen their frailty and accelerate their dependency. They are also the patients most likely to have delayed transfers of careor, worse still, spend their last days on a hospital ward. The GP contract requirements are the first steps towards a shift of focus and resources from reacting to the consequences of unmanaged frailty to a more proactive, holistic and person-centred approach to frailty care. Enabled by the development of the electronic Frailty Index (eFI), GPs are required to identify potential frailty, validate the level of frailty and then act for those patients living with moderate or severe frailty. The initial set of interventions are a medication review, a falls assessment if clinically indicated and encourage consent to activate the enriched Summary Care Record(eSCR). Finally, the assessment, diagnosis and actions should be coded. The following sections provide a summary of the situation at the end of Q4 2017-18. Further data tables and charts are available in the appendix to this report. Data is available for 7,008 GP practices across England with a combined number of registered patients aged 65 years or over of 10.05 million. This leaves 230 registered practices (and 0.2 million patients) missing from the available data. The average (mean) number of registered patients aged 65 years or over per GP practice is 1,434, representing around 17% (or 1 in 6) of the average list size. The median number of people aged 65 and over is 1,187 (interquartile range 628 to 1,979) and the practice with the highest number of registered patients aged 65 and over (Bay Medical Group, NHS Morecambe Bay CCG) has almost 13,000. 2.5 million registered patients aged 65 years or over are reported to “have had a frailty assessment using the appropriate tool”. This is 26% of the total population aged 65 and over. Three Strategic & Transformation Partnerships (STPs) have assessed more than 50%: West, North and East Cumbria (81%); Somerset (58%); and Bristol, North Somerset and South Gloucestershire (54%). Four STPs have assessed less than 15%: Northamptonshire (8%); Cornwall and the Isles of Scilly (10%); Mid and South Essex (11%); and Leicester, Leicestershire and Rutland (13%). 9% of GP Practices (651) have assessed 90% or more of their relevant registered patients, whilst 15% (1,080) have assessed 1% or less. 951,183 registered patients aged 65 years or over have a diagnosis of moderate (630,921) or severe (320,262) frailty. This increased by over 86,000 in the three months to 31 Mar 18 and represents 37% of those assessed. At an STP level, the percent of those assessed that have been diagnosed with moderate or severe frailty ranges from 13% to 73%. This is generally related to the overall level of assessments with those assessing more having a lower proportion diagnosed than those who have assessed fewer. Those with a high proportion of those assessed being diagnosed may be the result of adopting a prioritized approach to assessment related to the person’s Frailty Index based on the eFI. The approximately 1 million patients with a moderate or severe frailty diagnosis to date represent 9% of the practice population aged 65 and over. 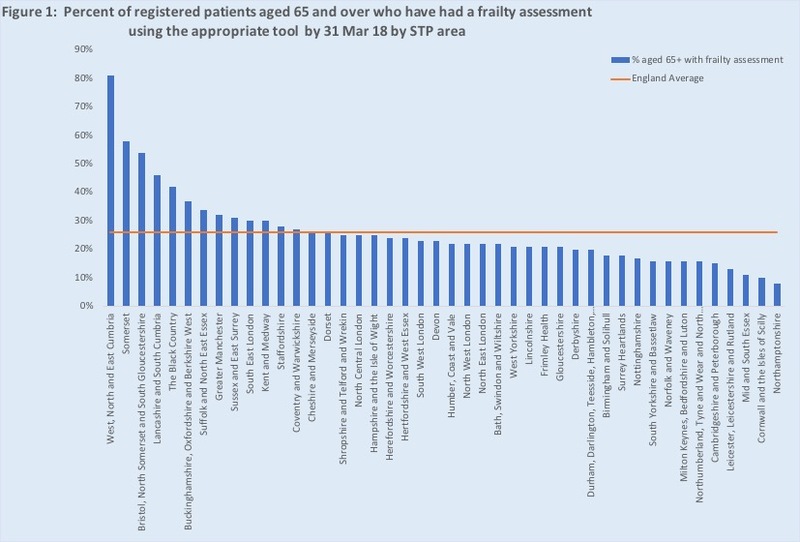 Northamptonshire (4.3%) and Cornwall and the Isles of Scilly(4.5%) STPs have the lowest percent of relevant population with a moderate or severe frailty diagnosis although they have also assessed fewest number of people. At GP Practice level there are four practices with more than 50% of their registered population having a diagnosis of moderate or severe frailty, whilst the interquartile range is 5% - 16%. 34% (224) have a diagnosis rate of 100% or greater i.e., they have diagnosed more people with moderate and severe frailty than would be expected based on the eFI based prevalence rates. At STP level the diagnosis rate varies from 28% (Northamptonshire and Cornwall and the Isles of Scilly) to 93% (West Yorkshire), broadly reflecting the ordering shown in Figure 2 since the expected prevalence (unadjusted for deprivation) only varies by 1.6% points – from 15.6% (Northamptonshire) to 17.2% (Surrey Heartlands). At a CCG level, NHS Stoke on Trent CCG has the highest diagnosis rate (145%) having assessed 34% of the relevant population. NHS Harrow CCG has the lowest diagnosis rate (10%) having assessed 10%. The ratio of moderate to severe frailty diagnoses is a potential indicator of current case mix and approach to coding. It is experimental as the contract guidance advises that it is for individual clinicians to determine whether it is clinically appropriate to code patients identified as living with moderate frailty. The analysis provides the opportunity to compare approaches being taken and also to promote more comprehensive coding of moderate frailty as a key area for development. The development of the eFI and selected thresholds for moderate and severe frailty implied that there are 4 people living with moderate frailty for every 1 person with severe frailty. The England average (mean) ratio based on the GP contract data is currently 2.2, indicating that moderate frailty is under-diagnosed (or under-coded). 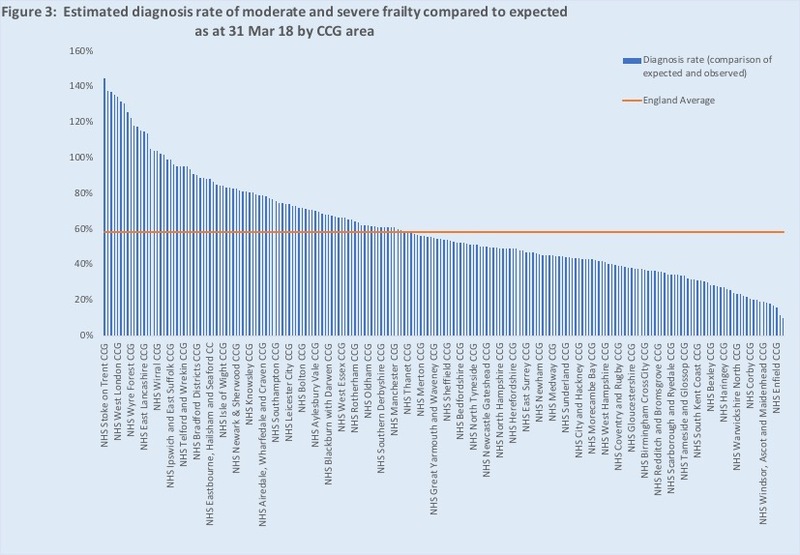 The mean diagnosis rate for severe frailty is around 92% (median across all practices is 52%), whilst for moderate frailty it is 49% (median 17%). This implies that there are practices with diagnosis rates for both moderate and severe frailty significantly greater than 100%. 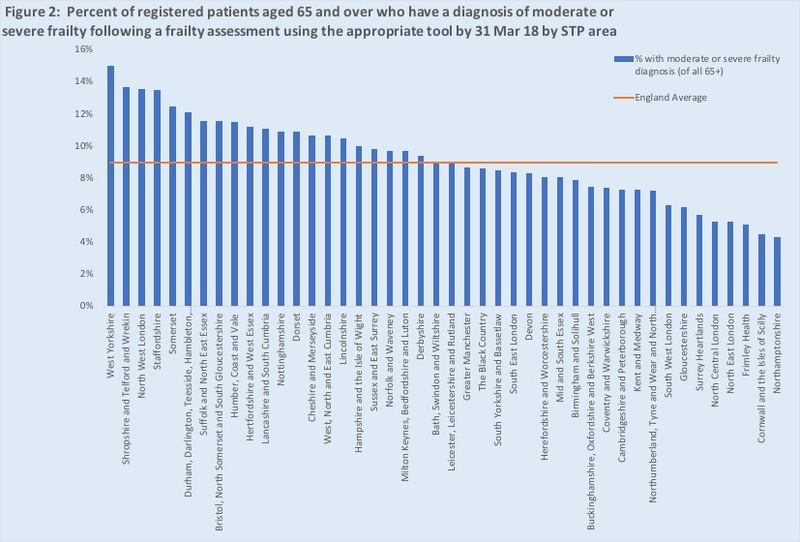 At STP level, the highest ratio of moderate to severe frailty diagnoses is Devon (3.1) with the lowest being Northamptonshire (1.2). At Practice level, the interquartile range is 2.3 (from 0.7 to 3.0). We have compared frailty diagnosis rates with those for dementia amongst the population aged 65 and over by considering the ratio of moderate and severe frailty diagnoses to the number of patients aged 65 and over on the dementia register. Given the current dementia diagnosis rate is estimated to be 67.5% , and the number of patients aged 65 and over on dementia register for practices reporting frailty data was 428,192 on 31 Mar 18, this implies there could be around 634,000 people with dementia who could potentially be diagnosed. The figure for moderate and severe frailty is around 1.63 million and hence the 'expected' ratio is 2.5 - 3.0 assuming no diagnosis gap from expected prevalence for either frailty or dementia. A lower ratio indicates that there may be under-diagnosis of frailty relative to dementia. A higher ratio potentially indicates the reverse. 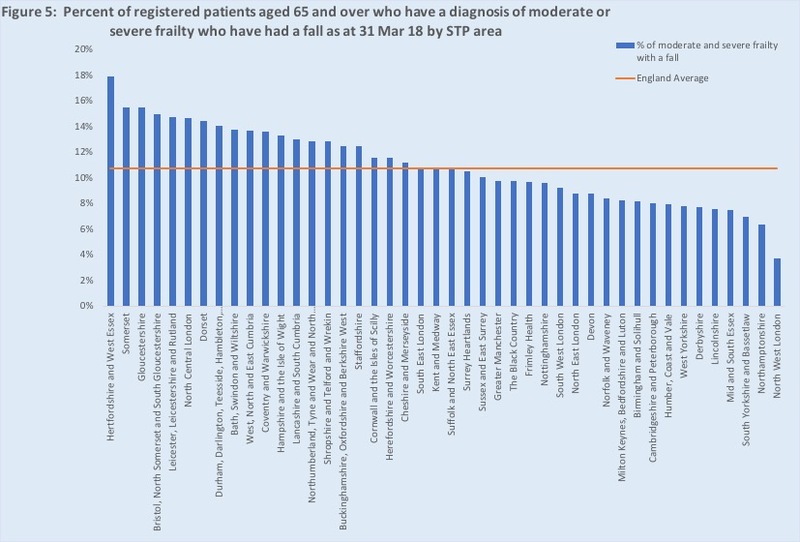 At STP level, the highest ratio of moderate and severe frailty diagnoses to dementia register numbers is West Yorkshire (3.3) with the lowest being Northamptonshire and North Central London (both 1.1). At Practice level, the interquartile range is 3.8 (from 0.1 to 3.9). A diagnosis is pointless without it leading to action. The requirements for post-diagnosis action focused on three evidence-based areas for intervention: medication reviews (for those diagnosed with severe frailty), falls prevention (identifying individuals who have had a fall and onward referral to a falls clinic) and gaining consent to activate the person’s enriched Summary Care Record (SCR). Overall, most progress has been made on medication reviews (66%) followed by 25% of those reporting having had a fall being referred to a falls clinic with 15% of target group having consented to activate eSCR. Almost two-thirds (210,687) of the 320,262 people diagnosed with severe frailty have been coded as having received an annual medication review on or after their severe frailty diagnosis. 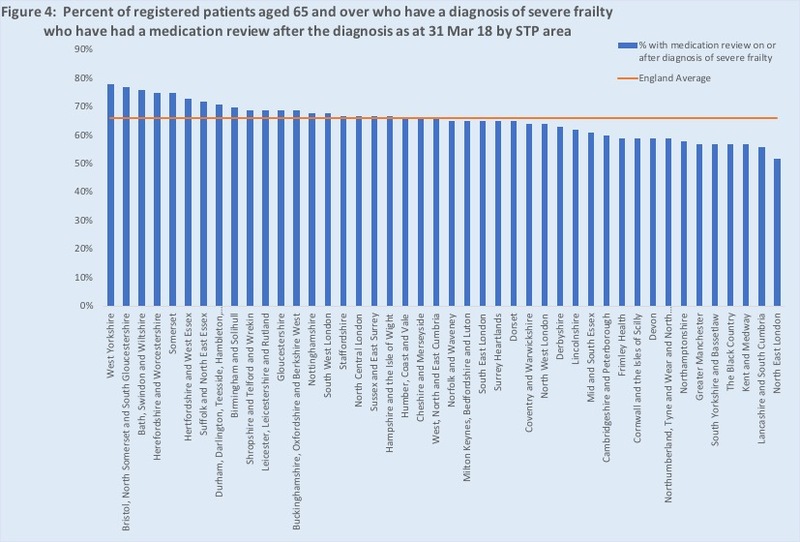 At STP level thepercent of patients with a diagnosis of severe frailty who have received annual medication review after the diagnosis varies from 52% (North East London) to 78% (West Yorkshire). 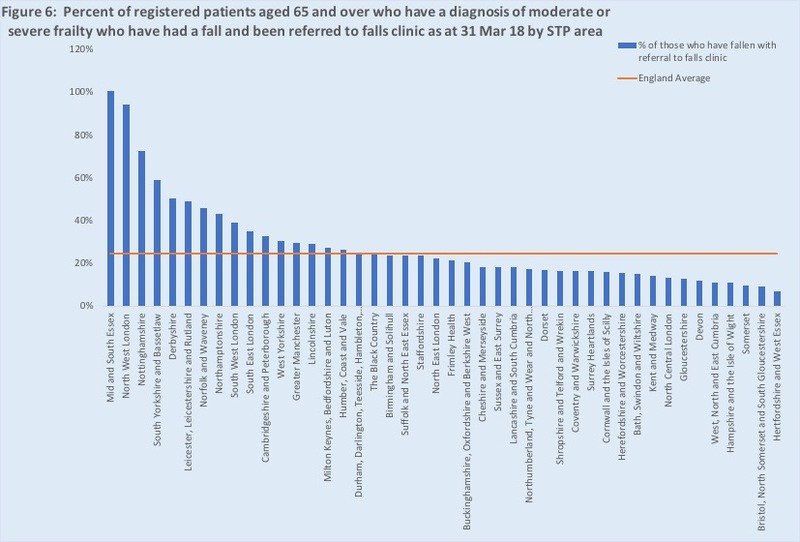 At a CCG level, NHS Rushcliffe CCG has the highest percent of severe frailty patients having received a medication review (89%) but local GP practices have only assessed 12% of the relevant population. NHS Tower Hamlets CCG has the lowest recorded medication reviews (34%) having assessed 15%. At GP Practice level there are 542 practices (8%) that have a diagnosis rate of at least 50% and have completed medication reviews for at least 90% of patients diagnosed with severe frailty. By contrast there are 694 practices that have a diagnosis rate of at least 50% and have completed medication reviews for at less than 50% of patients diagnosed with severe frailty. Across all practices (regardless of assessment and diagnosis rates) the interquartile range for completed medication reviews is 41% (from 49% to 90%). Around 1 in 9 (11%) of the 951,183 people diagnosed with moderate or severe frailty have been coded as having had a fall. These 102,378 people implies a falls incidence rate of around 0.04 for the population aged 65 and over who have had a frailty assessment (2.5 million). However, NICE Clinical guideline [CG161] Falls in older people: assessing risk and prevention published in June 2013 stated that “People aged 65 and older have the highest risk of falling, with 30% of people older than 65 and 50% of people older than 80 falling at least once a year.” This would imply that there is significant under-recording of falls, with an estimated 3 million people aged 65 and over falling every year. Given people living with moderate or severe frailty would have highest risk of falls (one of the frailty syndromes) most, if not all, would be expected to have fallen at least once during the year. At STP level thepercent of patients with a diagnosis of moderate or severe frailty who have had a fall varies from 4% (North West London) to 18% (Hertfordshire and West Essex). At a CCG level, NHS Fylde & Wyre CCG, NHS Leeds North CCG and NHS East and North Hertfordshire CCG have the highest percent of moderate or severe frailty patients having had a fall (24%). NHS Bradford City CCG hasthe lowest recorded percent of falls (1%). At GP Practice level the interquartile range for patients with a moderate or severe diagnosis of frailty who have also had a fall is 16% (from 3% to 19%). 1 in 4 (25%) people reported to have fallen had subsequently been referred to a falls clinic. In total there had been 25,570 referrals. This had increased from 10,253 at 30 September 2017 and 18,024 at 31 December 2017, although the falls clinic referral rate was broadly unchanged as there had been a comparable increase in reported falls over the same period. At STP level thepercent of patients with a diagnosis of moderate or severe frailty who have had a fall and then a subsequent referral to a falls clinic varies from 7% (Hertfordshire and West Essex), who had a relatively high percent of fallers (18%) to 101% (Mid and South Essex) who only had 8% of fallers. There is almost a ten-fold difference in Falls referrals per 1,000 population aged 65+ across STP areas (from 0.8 to 7.6). At a CCG level, NHS Southend CCG has the highest percent of moderate or severe frailty patients having had a fall who have also been referred to a falls clinic (229%, implying 2.3 referrals per faller!). NHS Vale of York CCG has the lowest percent of fallers subsequently referred to a falls clinic (3.4%, implying 1 in every 30 fallers). At GP Practice level the interquartile range for fallers being referred to a falls clinic is 48% (from 0% to 48%). Over 140,000 people with a diagnosis of moderate or severe frailty had consented to activate their enriched SCR. By end of March 2018, this represented around 1 in every 7 people with a moderate or severe frailty diagnosis (15%). This had increased from 7% at 30 Sep 17 and 11% at 31 Dec 17. At STP level thepercent of patients with a diagnosis of moderate or severe frailty who have consented to activate their enriched SCR varies from 5% (The Black Country) to 42% (Leicester, Leicestershire and Rutland). 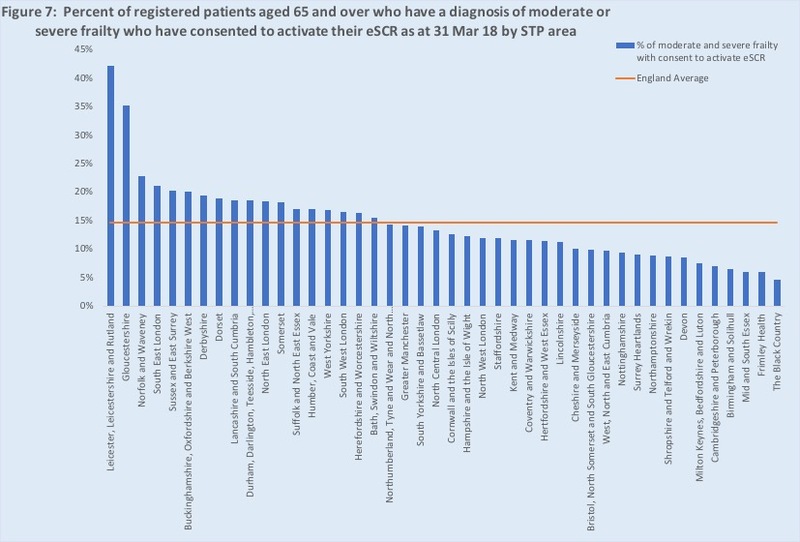 At a CCG level, NHS West Leicestershire CCG has the highest percent of moderate or severe frailty patients having consented to activate their eSCR (58%, or more than 1 in every 2 people). NHS Thanet CCG by contrast has the lowest percent (0.5%, less than 1 in every 200). At GP Practice level there are 55 practices with diagnosis rate greater than 50% and more than 90% of moderate or severe frailty patients having consented to activate their eSCR. There are nearly 20 times as many practices (988) that have secured consent from 1% or fewer older people diagnosed with moderate or severe frailty. The interquartile range across all practices reporting data for percent of people with a diagnosis of moderate or severe frailty who had consented to activate their enriched SCRis 26% (from 0% to 26%). At the early stages of any major change programme, it is vital to identify what might be considered ‘positive deviance’ and what it is that the ‘positive deviants’ have done differently. They have obtained consent from 90% or more of those people diagnosed with moderate or severe frailty. Falls data was not considered as part of the criteria, although all except one are above the median level for recorded falls (9%) and median level for subsequent referral to a falls clinic (17%). There are two practices each from NHS Somerset and NHS Blackpool and one each from NHS Greenwich and NHS Bradford Districts. All were rated “Good” in their most recent CQC inspections. The practices above may not be the best examples when other factors are considered, however, on the basis of the available contract data they have made most progress in implementing the contract requirements. 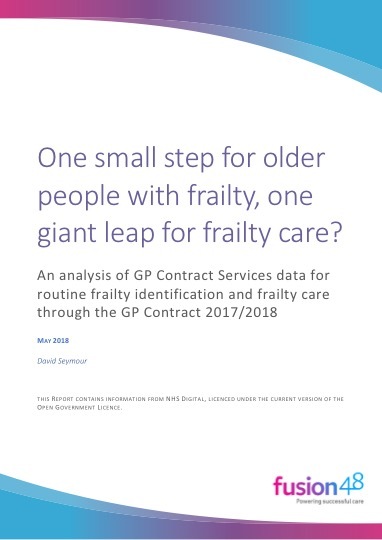 As a result, they are likely to have taken larger steps towards improving care for older people living with frailty than most of the other 7,000 GP practices. There are likely to be many more ‘positive deviants’ at a local level in each STP and CCG area. These, along with the practices struggling to implement the contract requirements, can be identified from the available data. The development of the eFI and subsequent changes to the GP core contract are potential ‘game changers’ for frailty care in England. They position the NHS and adult social care services to be international leaders in becoming fit for frailty and this position will be further strengthened by the Frailty Core Capabilities Framework which is expected to be published in September 2018. It is inevitable with any new approach, particularly given the significant operational pressures across primary care, that there will be wide variation in activity, actions and data quality across GP practices (and consequently CCGs and STP areas). This variation should not undermine the efforts, rather it should be viewed as highlighting the opportunities to have greater impact and learn from the ‘positive deviants’. Older people living with moderate and severe frailty have a proven increased risk of hospitalization, extended lengths of stay, and admission to long term care and, as a result, increased health and adult social care costs. Commissioners and providers alike must seize this opportunity to work with primary care to increase awareness and understanding of frailty and the benefits of implementing the core contract in full. Aligning their approaches to the forthcoming frailty core competences framework will support a more integrated approach to frailty from strategy to implementation to operational considerations. And that should just be the starting point in the journey from reacting to the consequences of unmanaged frailty to more proactive, holistic and person-centred approaches to frailty care. This report contains information from NHS Digital, licenced under the current version of the Open Government Licence. Whilst every effort has been made to check the analysis, please feedback any errors or misinterpretations to the author David Seymour david@fusion48.net. Detailed information on the definitions of the metrics and data sources accessed can be found here. Calculation of the estimated frailty diagnosis rate is available here. Download the appendix to this report. Inevitably, there are likely to be data quality issues clouding the situation. Fit for Frailty is a British Geriatric Society (BGS) campaign that includes two-part guidance on the recognition and management of older patients with frailty in community and outpatient settings.